Then it dawned on me: Hey, there's a new weekly Batman series starting, headed up by Snyder, but written by various writers covering a variety of characters and situations in Gotham City. 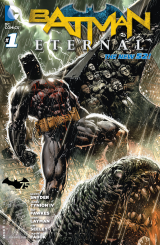 This new series, Batman Eternal, was just the opportunity I was looking for! So, pushing aside my Batman movie script plan (yeah, I'm doing that), DBZ voice comparison chart, and waning NationState nation (need to catch up on the issues given) for a while, I'm giving this a go to see if anybody even notices (they won't) and hoping to make it through the run of the series (no confidence at all). So, with the preamble out of the way, let's get to the first issue of Batman Eternal, #1, whose story derails the illustrious career of one James Gordon. 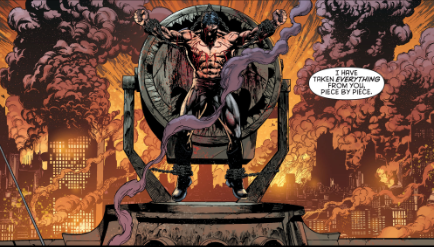 The first page drops us into a vague time known as "THE END", some point in the future, when a chained up, bloodied, and seemingly defeated Bruce Wayne, only half in his Batman costume, is taunted by some unseen person as Gotham City burns around him. The flames reflect in Bruce's apolocalypse-weary eyes. It's quite a striking group of images that sets up great expectations. What happened to this town now? In just the past couple of years, it's been overrun with undead assassins, gripped by fear of the Joker, attacked by legions of brainwashed children, and decimated by Arkham and Blackgate breakouts (see Forever Evil). So what now? And who's that who's behind all this, assuming they're the one talking to Bruce here? We cut to "NOW", which I guess takes place, you know, at some point as you are reading this, or shortly before. Or maybe it took place when I first read it! Or wait, maybe it took place when Scott Snyder and James Tynion wrote it. Roughly at this point in present time, in other words. Let's not get too hung up on the whens of it, shall we? No? Okay, then it took place next Tuesday. 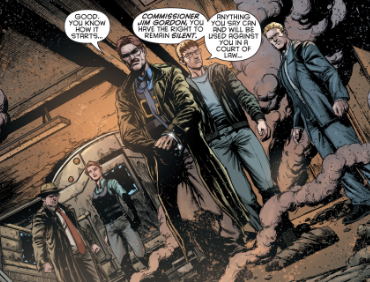 Anyway, "now" is when Jason Bard, a one time supporting character in the previous continuity makes his New 52 debut as a newcomer to the Gotham City Police Department, welcomed to town by Harvey Bullock. Bard was expecting Comssioner Gordon, but Gordon is busy assisting Batman in his fight against the Grant Morrison invented madcap lunatic Professor Pyg. The villain had taken children to become his obedient "Dollotrons", but were saved by Gordon before they could be fully converted. Gordon, pinned down by gunfire, is himself saved when Batman arrives in an armored suit, punches the tail off a biplane, and takes off after Pyg and his men with the Comissioner in tow. Chasing one of Pyg's men into a subway tunnel, Gordon tries to talk the man into surrendering his firearm, but the man insists he's not holding one. Gordon fires on him, but it hits a high voltage fuse box that causes a track switching malfunction on the tracks. Batman arrives to rescue Gordon from two trains that plow into each other. Gordon is devestated that his actions caused the two trains to collide, reasoning he did what he thought was necessary to disarm a suspect, but Batman confirms that the man he fired on was never holding a gun, according to the security footage he patched into. Batman offers to remain with Gordon as the rest of the police and fire crews arrive, but the commish insists he does what he can to save any passengers that are trapped. Gordon's colleagues, including Bullock and Bard, arrive on the scene and Gordon admits he fired the gun that caused the reaction. One Major Forbes is outraged, accusing him of manslaughter. He tells Bard to make his first arrest: Comissioner Gordon, and the newcomer reads him his rights as he walks him away in handcuffs. Closing the first issue, however, we get a panel that peeks back into the future, where the mysterious voice speaks of a "grand design". Are they responsible for the events of this issue, which presumably leads to the burning of the city? All part of one big, concerted plan? We'll have to read on to find out, apparently. I know my interest is piqued. They certainly kicked this issue off in a big way, promising the reader a villain whose plans are so vast and destructive that they bring the city to its knees and leaving it a flaming heap at some point. However, that sort of opening, and kicking it off with a train crash that kills ostensibly hundreds of people (according to Forbes, but I doubt it) is also a huge burden on the writers. It's a huge check being written that if they don't cash will be a huge letdown. One can easily be weary of this repeated "near-apocalypse" state that has almost become Gotham's status quo. Dixon did it. Morrison did it. Geoff Johns and Peter Tomasi did it in Forever Evil. Now Snyder (and others) are doing it. If Snyder wants to stop being accused of merely following in Morrison's footsteps (something I disagree with, but have read), he's going to have to do a lot better than just another "hell in Gotham". The journey, not to mention the ultimate pay off, had better be top notch. One question I had on my first read was, "Wait, why would hititng a single fuse box cause the tracks to fail to switch, leading to an accident?" But then I recall Gordon bringing up the same question. He says specifically that the fuse boxes "don't control rails, they're just... just for station power. 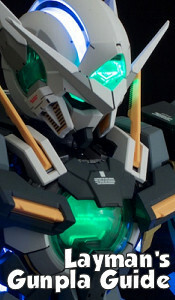 Lights... turnstiles..." That, paired with Gordon and the reader seeing the perp holding a gun when nobody else could leads me to believe that there's definitely some trickery and planning by somebody going on here, possibly involving illusions. But how, I ask, could whoever it was know that Gordon was going to chase that particular henchman down that particular subway tunnel? It boggles the mind. And the answers had better deliver. If I had to pick a favorite moment in the issue, aside from Batman's grand entrance, it would be the panel where Batman offers to stay with Gordon when the police arrived. Jim, of course, refuses, preferring he spend his time rescuing people, but that Batman offered when Gordon expected he would disappear is kind of sweet and shows that Batman cares about Gordon. You might want to contact your union rep, there, Jimbo.